Take the trail that goes along the river. Follow the Trail 7 signs, basically staying not far from river, going past Jasper Park Lodge and up a hill and then back down the other side. When you reach the road that goes to your left across the bridge, you will actually turn right and cross the roads over to the trail running towrds the mountain range on your left. It is NOT marked with a sign. Follow the flowing singletrack along here and then a bit of the Lake Edith cottages road to the next trail portion (unmarked as well). It is on the left side of the road. Follow this a ways to a Trail sign. Take the Trail 7. Now the real work begins. This is a pretty good uphill that runs along the road that takes you up to Maligne Canyon. You will pop out at a parking lot for Signal Mountain. Go thru this to the trail on the opposite side. If you turn to the right instead you will be doing a five mile climb up Signal Mountain, so don't turn at the parking lot, go straight across. Follow trail and it will come out by the road and a bridge. The trail naturally crosses the bridge. Cross road here and the trail carries on, on other side of road. Follow this trail through trees and you will come out near the parking lot for Maligne Canyon. Cross the road away from the parking lot. You will see horse rails, for tying up horses. The Trail 7 continues here and becomes 7H. There is a short climb to some incredible views and then an incredible downhill. Make sure your brakes work BEFORE starting down the hill. This hill would be too difficult for a beginner rider and some intermediates. At the bottom you pop out half between 5th Bridge and 6th Bridge. Turn right and follow to 6th. Cross the bridge and follow trail along river for abit. Make way back to Fort Point via many different routes. Review: Great trails, stuck to 7 from Fort Point to Sixth Bridge, crossed the Maligne Road to the next section and followed 7 back to Fort Point. No snow, a few patches of ice but mostly great riding. 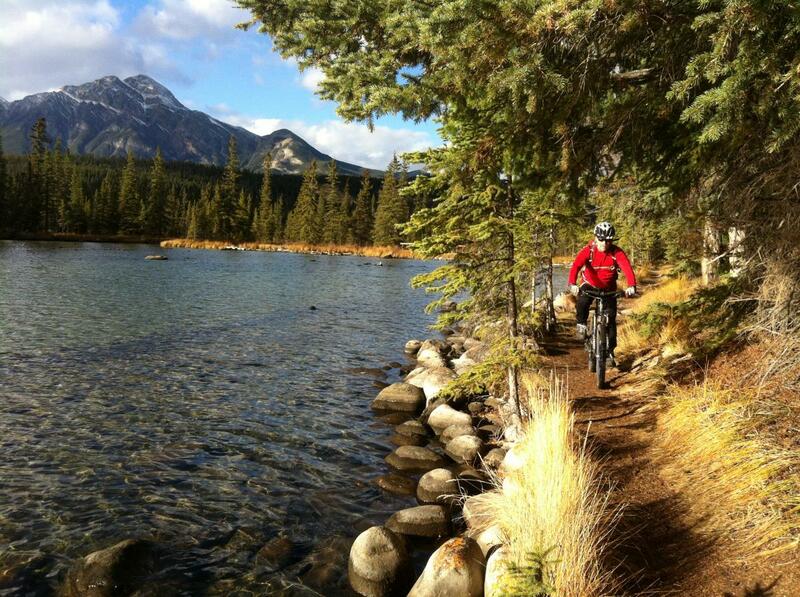 Review: Rode fat today, from town to the bridge off Highway 16 that takes you to the Jasper Park Lodge. Most of the trail was really good, well packed along the river. However the climb by the lagoon lake by Jasper Park Lodge and onward was very loose snow. Did a fair amount of hike-a-bike for about an hour. Should have a nice base set up tonight. Review: did a great ride from Jasper in a big loop, a lot more sections of Trail 7(pieces) were open. Calving season is over and apparently grizzly bear season hasn't started lol. Great day to zip along, pushing the speed where we could. Review: Did again today and it was even more fun. The downhill portion is a hoot. Review: if you want an easy to do downhill ride this is your trail. For the amount of actual climbing involved, the downhill is a pleasant surprise. Trail 7 / 7H (Teahouse) MTB Trail 4.80 out of 5 based on 5 ratings. 5 user reviews.